Tonight, Mikey and I are premiering a new weekly column for the site. 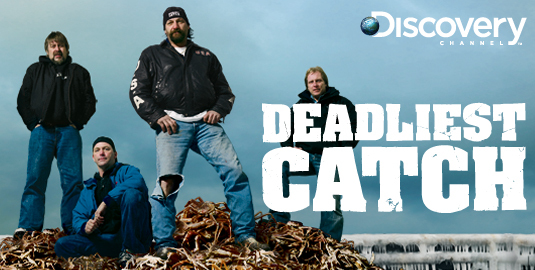 With Hell’s Kitchen winding down (thank god) we are proactively filling the void with a show that’s actually worth watching: Deadliest Catch. This weekly column will probably go up on Wednesdays, but because I was retarded and forgot to tivo the 1st episode, I had to wait until tonight to watch the rerun. Each week, it is my hope that we can not only give a little commentary on the show, but also a review on the culinary bounty that is the ocean. First the show, then the review… enjoy! For those of you who don’t watch the show, Deadliest Catch is about the men (and the occasional woman) who make it possible for us to eat crab. They fish the most dangerous waters in the world, fighting brutal weather, 24+ hour shifts and the constant threat of injury or death. Mikey and I actually had the chance to meet one of the captains, named Sig, who runs the ship Northwestern. I gotta say, he is just as badass in person as he is on the show. For the people who have seen the show, the four main ships all return for the king crab season: The Wizard, Time Bandit, Cornelia Marie and our boys on the Northwestern. The season starts off on a dramatic note with the return of Capt. Phil who had a blood clot almost kill him last season. In addition, Capt. Keith of the wizard is waiting on pins and needles for a call letting him know whether he has cancer. I’m shocked that these guys even make it to 50. They all smoke about a carton a day, drink like pirates and eat from Michael Phelps training table. If I did that, I would capsize the boat just by getting on. Anyway, I don’t want to ruin the whole show for those of you who are going to watch. But I will say that this season looks like it’s going to be a lot of drama. It seems as though Keith and Phil have softened up due to their health issues, but Sig and the Hillstrand bros are still up to the same old fun and games, from biting the head off the herring to punking the new deckhand with a cold shower. The feel good moment of the show was the Time Bandit pulling up some huge pots, but was followed up immediately by Keith of the Wizard getting cracked on the skull right at the end of the episode. I don’t know what will happen next, but this is shaping up to be the best season ever. In honor of Deadliest Catch being back on the air, I was looking for seafood. In the tradition of EatMeCalifornia though, I wanted to introduce you to a place you’ve probably never heard of. Gino’s is that place. It is a little hole in the wall, right on the boulevard and if you blinked, you probably just drove past it. 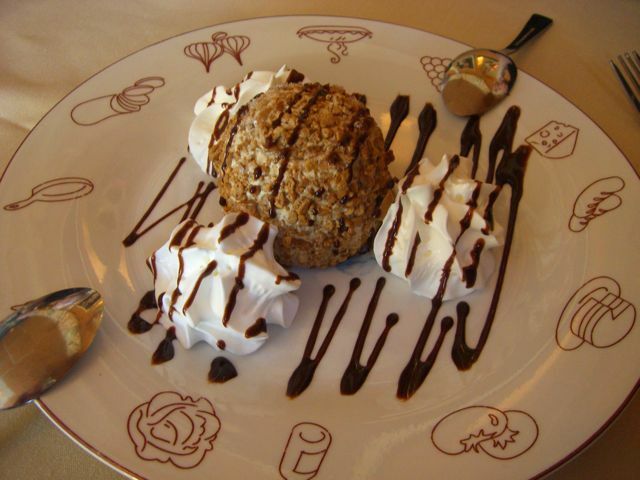 For anyone who is lucky enough to have eaten here, you’ve undoubtedly met the owner, Gino. He may, in fact, be the most personable guy on the planet. I have been here 4 or 5 times over the years, and yet I feel as if I know the man like he’s family. He is from Naples and brings the cooking of his homeland to a city that is desperate for decent Italian food. The other thing, besides Gino, that is awesome about this place is the fact that they have specials that change daily. These aren’t the standard, what-looks-old, gotta-get-rid-of specials. These actually live up to the billing. They have a pretty big menu, but inevitably Gino ends up talking me into one of the 5 or so specials that they have for the night. Last night he got me on the seafood linguine with clams, mussels, shrimp and calamari. 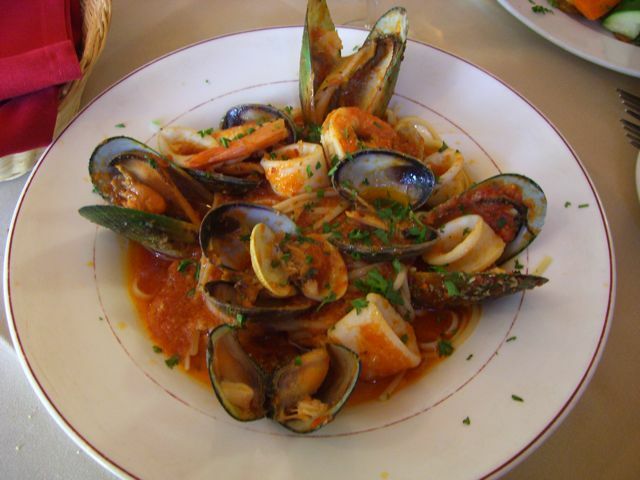 The seafood was perfect, not too tough, and the pasta was bathed in a spicy tomato sauce that was almost broth-like in texture. 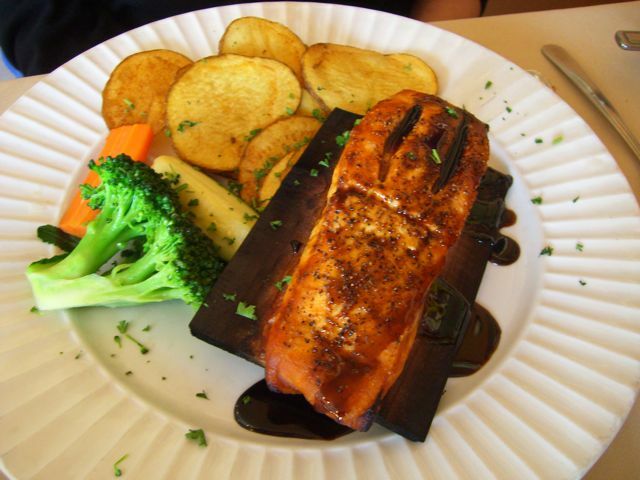 My mom had the cedar-plank salmon with balsamic glaze. She gave me a bite and although I don’t care for salmon, this was not fishy at all. The glaze was great because the sweetness really brought out the flavor of the fish and made it palatable, even for a salmon hater like me. My Aunt had the filet of sole with a lemon caper sauce. The sole was very delicate, but not so much that it was falling apart. 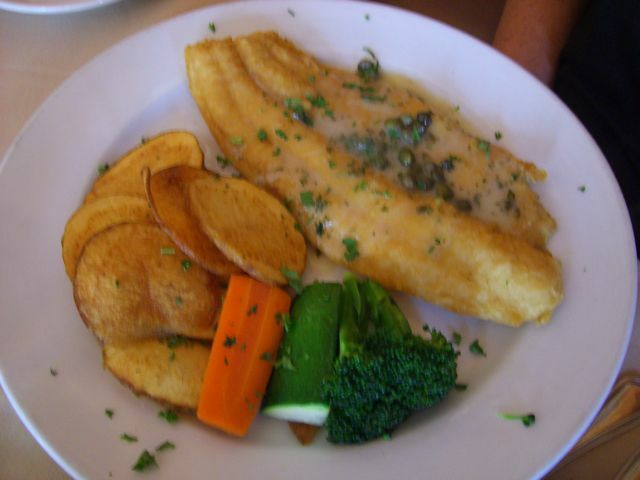 I am a big fan of capers and as expected, they added much needed flavor to the mild sole. Of all the things I tried, I enjoyed my pasta the best. The sole is a little too “one-note” for me and we already discussed my distaste for salmon. By the way, if anyone knows a good salmon dish for me to try, I’m still open to conversion. 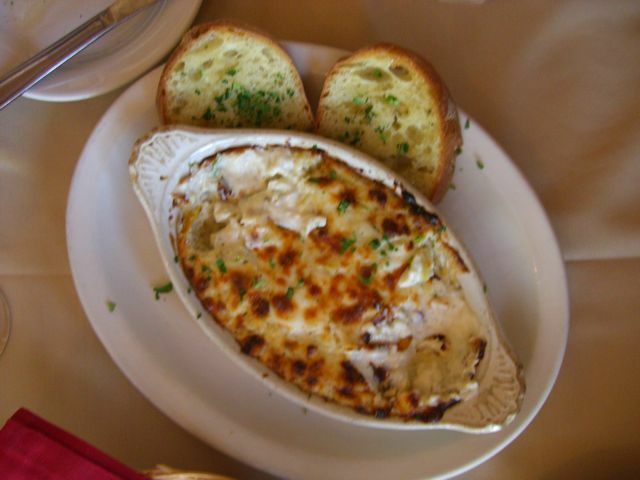 Also, we started the evening off with an awesomely creamy artichoke dip that I would recommend to groups of three or more. The only issue I had with the app was the fact that we didn’t have enough bread to eat with it. We ended up taking it home and I am told that it made for a decent lunch today. Last but not least, we finished the meal with a complimentary shot of chocolate liquor (homemade by the man, himself) and a crispy cappuccino ice cream. The outside of the ice cream almost tasted like the cinnamon coating on a crumb donut and went very well with the coffee flavored center. Gino’s is open nightly (except Monday) for dinner service at 5:30. They do not serve lunch. Anyone in the Thousand Oaks area would do well to give them a try one of these nights. They also turn the dining room into a dancefloor at 10pm on one of the weekend nights and offer free dance lessons (samba, swing, etc.) 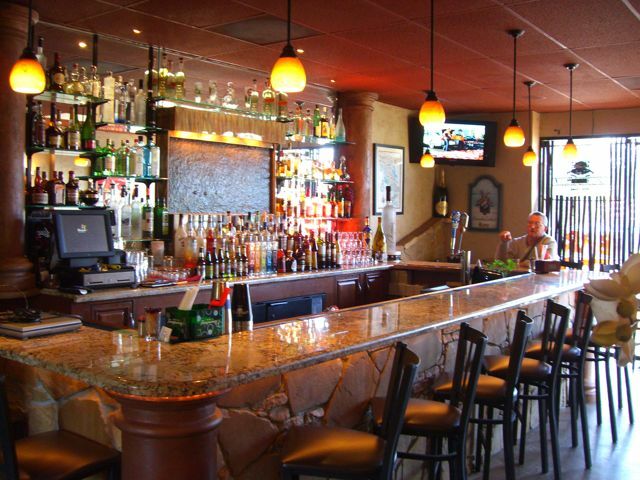 They have a beautifully decorated full bar, and a fun atmosphere to enjoy. Stop in and tell Gino that you heard about them on the Internet. If he gives you a quizzical look, followed by a big smile, it’s because he has no idea what the hell the internet is. That, or he’s been swilling a bit too much of his chocolate liquor. I was expecting a review of some Alaska King Crab? Maybe next time. Absolutely! They just didn’t have any on offer. This is my new mission for the week. Is it really necessary to pause Deadliest Catch? What can he possibly miss? More fish? @Sammanthia ROFL!!! There might be a great Marlin attack or, or a giant crab could PULL THEM OVER THE SIDE!! The drama. THE DRAMA!!! @Sammanthia What’s he playing? I love that guy! Does he have a rain jacket on too?! I bet those burly fisherman DIG Moby! @talleyklotz And then the music cues to Celine Dion when the captain rescues them and then they all drink a beer. I love Gino’s! He’s always giving away chocolate liquor shots! Right you are, Gabrielle. And those chocolate liquor shots are HOMEMADE. I gotta get my hands on that recipe. Maybe not though, because I’d be to wasted and fat to continue with writing this blog. Thanks for checkin’ in. Btw, where did you find us?